Anyone got a time machine they'd loan out? Well I'll be Gum Dipped!!! Interesting statement "Gum Dipped" is embossed my my Firestone Tyres too. Any idea what that is all about??? It apparently wasn't needed in the sale above. Those look like 19" or 21" to me. Probably Model A era or later. Most of the "Non-Skid" tires had "Gum-Dipped" on them and later production of the tires for restores continued to have the words even if the make up of the tires was a newer process. Problem is I don't think he would accept today's money. And don't even try a credit or debit card. $3.60 was a lot of money in the 1920's and with inflation would likely be equal to the $150 we pay today for a 30 x 3-1/2 tire. Can you think of any product other than the Model T that went out of production in 1927 that you can pick up a catalog and order most any part for? Dang! my time machine broke last week and I need to get to 2055 to get a new framitz. That photo was taken well into the thirties. Note the base of the console radio set, just inside the window to the right. The streamline styling on it tells me that this is from 1934-39, or thereabouts. Most likely a "Firestone" brand radio. 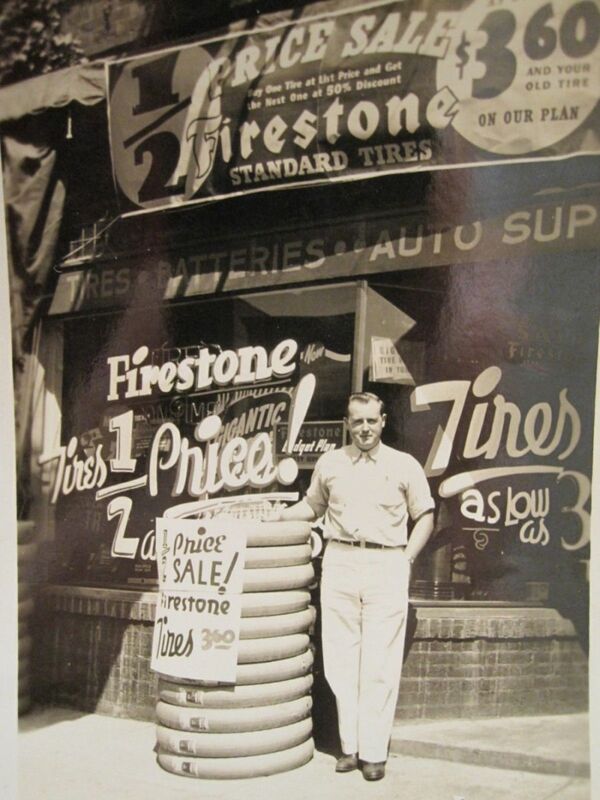 Firestone had branded products other than tires, like bicycles, batteries, etc. similar to Western Auto and Pep Boys. For many folks $3.60 was harder to come by in the thirties than in the twenties. Mike Spaziano I think it is just possible that you were a eagle in your last life, you certainly have an eye for detail. FYI, $3.60 spent in 1935 would equate to $62.39 in today's dollars. Maybe not an eagle, but I do work with Richard Eagle's daughter. Does that count? Don't forget the sign says buy 1 at the regular price and get the second one at half price (and your old tire) so your total bill for the 2 tires would be $10.80 + tax or $148 + tax in today's dollars so a pretty good price when you pay $100 + per tire today. Don't forget that when you travel back to 1935 to buy those tires, you'll have to take 1935 money with you. Depending on serial number and condition, a $10 bill will cost you anywhere from $10 to $60. A $1 bill in average condition can be had for about $12. Some of that will be offset by the two dimes you get in change. Those will be worth anywhere from $4 to $20. If you get just the right Mercury dime it will be worth hundreds, but it's valuable because it's rare, so that's unlikely. Mike, that counts for something. I'm not sure what. Do you suppose the first tire comes fully mounted and the other is "Half Off"? Are you sure you did not stay at a Holiday Inn? I remember a story my grandpa John Gunter told. He said that in the Missouri Ozarks of the early 1930s, a Model T Ford could be bought for as little as five dollars. He bought a roadster for $5 that would run but had worn out tires. Then he bought a set of slightly used tires for $10. He drove the car to his job in West Plains, Missouri, which was about 20 miles from home in Ozark County, MO. One day John was driving down the street and a man on the sidewalk yelled out, "What would you take for it?" John said, "Give me twenty dollars and I'll walk home tonight." John walked the twenty miles back home that night. I don't recall how he got to work the next day but he had twenty dollar in his pocket--a profit of 5 bucks.